If you are looking for a midsize sedan, what features do you want? At Mills Ford of Willmar, our team is impressed with the Ford Fusion because it comes with technology features that offer many perks. Let's check out some of the Fusion's technology features. The available SYNC 3 infotainment system is offered with the Fusion. This infotainment system lets you make hands-free calls with Apple CarPlay and Android Auto. Apple CarPlay allows you to easily access Siri, Apple Music, and Apple Maps. With Android Auto, you can connect to Google Now, Google Maps, and Google Music. You also get a free trail to SiriusXM Satellite Radio, SiriusXM Traffic, and Travel Link. 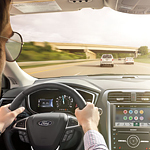 With the Fusion, you can take advantage of FordPass Connect. This is an in-vehicle Wi-Fi hotspot by AT&T that can power up to 10 devices, and it can be accessed from up to 50 feet outside the Fusion.